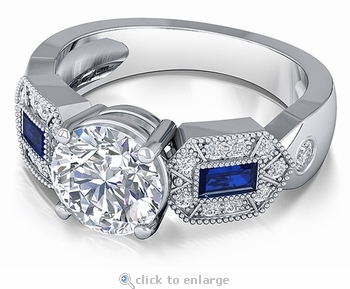 Our Bulletta 2 Carat Round Cubic Zirconia Man Made Simulated Sapphire Solitaire Engagement Ring features an 8mm round 58 facet original Russian formula cubic zirconia center stone that is hand cut and hand polished to exact diamond specifications. This ring reminds you of a great Art Deco style solitaire from the past. 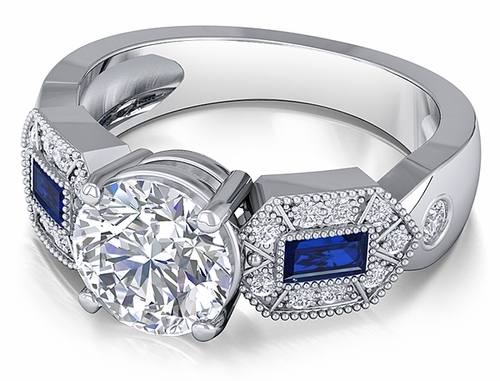 The Bulletta Solitaire Engagement Ring showcases a 2 carat round diamond look cz center stone enlivened by two custom cut baguette simulated man made sapphire colored gemstones. Both sapphire blue baguette cuts are uniquely framed by an array of micro pave prong set rounds in a beaded motif style arrangement. An additional round stone is bezel set on each end of the motif. The band measures approximately 5.25mm at the widest point. Due to extremely low pricing, all clearance items are a final sale.